“You’re out here on as good a day as you’ll ever get,” shouts the guide as he throttles the engine of our inflatable boat, steering it towards the mouth of the river. Decked out in a wetsuit and snorkelling gear, I sit on the edge of the speeding vessel like a special operations frogman, riding the swells and gazing out at Hudson Bay. In the distance, countless white blobs break the surface and disappear beneath the dark waters. The guide slows the boat, pulls off his reflector shades and crouches down and looks me in the eye (while tweaking his moustache for added emphasis). In seconds I’m in the frigid water holding onto a towrope and staring into the murky Leviathan depths. Pale blurs soon become visible in the distance. Then, without warning, the phantom-like whales appear directly beneath me, turning sideways and gazing up with their benevolent expressions of stoic curiosity. 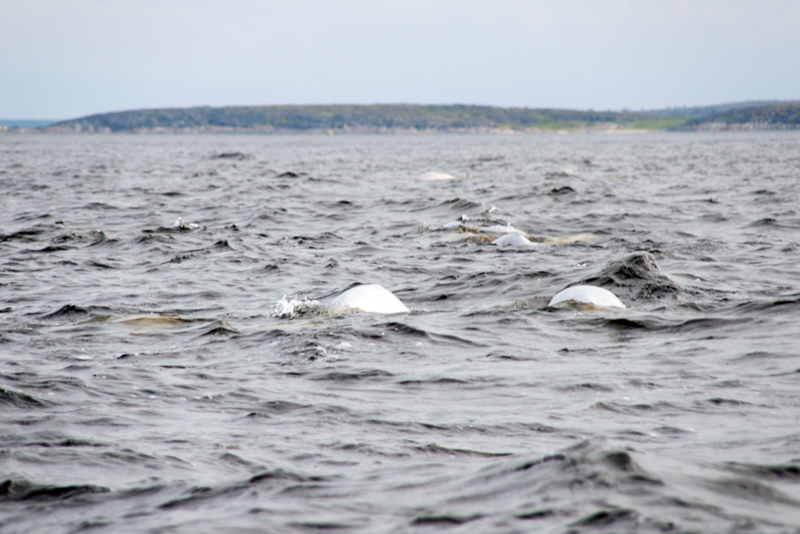 The belugas appear with remarkable clarity and approach in groups of three or four, coming as close as a few metres away. The water is filled with whale chatter: a mixture of bird-like chirping noises and bursts of sound not unlike short-wave radio static. It is a surreal and moving experience. Every summer about 3,000 belugas whales enter the Churchill River, which flows out of northern Manitoba, Canada, and into Hudson Bay. The animals come to the relatively warm waters between June until August to feed, give birth and raise their young. I’ve travelled to the adjacent town of Churchill to see this wonder first-hand and to explore a place known for its eclecticism, quirkiness and nearby natural wonders. Churchill is Canada’s principal Arctic-area seaport, located on the western shores of Hudson Bay. This sub-Arctic hamlet, in which no road leads in or out, has a population of just 1,000 souls. It bills itself as both the beluga whale and polar bear capital of the world. If that isn’t enough, it’s also a self-described birdwatching paradise and the best place on the planet to view the aurora borealis, otherwise known as the northern lights. 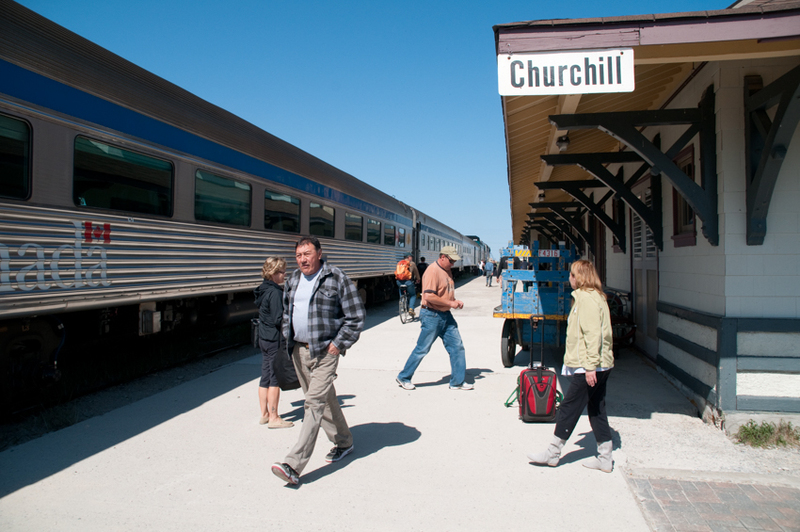 I shrugged off the easier option of flying into Churchill and opted instead to travel two days by train along the 1,700-kilometre route from the city of Winnipeg. Sky-blanketed prairies and fields of yellow canola gave way to boggy, spruce-filled boreal forests and, later, to the balding, thawing, permafrost-laden tundra from which Churchill emerged like a northern mirage. The area has been home to Inuit and pre-Inuit peoples for several thousand years, but Churchill’s contemporary beginnings lay in colonial Europe’s quest for empire and resources. The first foreigners arrived in the region when an ill-fated Danish expedition to find the Northwest Passage, led by Jens Muncks, wintered on the site of modern day Churchill in 1619-20. Only three of the 69 expedition members, including Muncks, survived the bleak conditions and unexpectedly harsh winter. In 1717, England’s Hudson’s Bay Company built the first permanent settlement near the mouth of the Churchill River. This remote and battered outpost, manned by hardy overseas adventurers, was one of Britain’s largest fur trading stations in North America. Access to the Atlantic and to a lengthy river and lake system extending south and west, made the Churchill area an ideal base for Britain to extend its influence across the frontier. The Hudson’s Bay Company’s Prince of Wales Fort, which was conquered briefly by the rival French in 1782, and whose stalwart, renovated remains can still be visited today, took more than 40 years to build. Today’s Churchill is located across the river from those original settlements. It appears from the air like a tiny blip in a wide-open, potholed and elements-whipped terrain. The town’s main landmark is an architectural monstrosity of morbid aesthetic appeal: an imposing grain lift and port facility built in 1929. 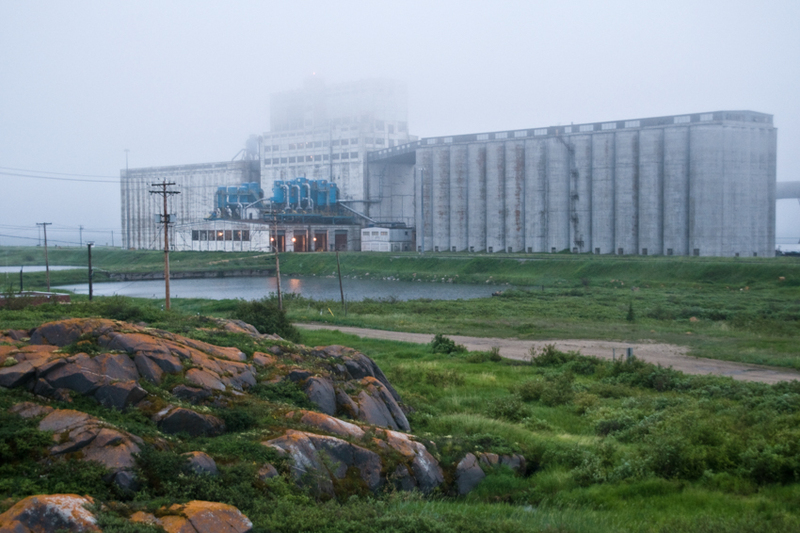 The port – Churchill’s raison d’être – employs a quarter of the town’s population and exports Canadian wheat and other commodities to the rest of the world in summer and early autumn. Unsurprisingly, Churchill is quiet and subdued. In summer, the town’s residents – about half of whom trace their ancestry from northern aboriginal roots (Inuit, Cree, Métis, Chipewyan) – can be seen sauntering about on foot or on ATVs (snowmobiles and even dog sleds are de rigeur in the deep freeze of winter). Apart from the port, the other gathering points for people are two cafe-restaurants, a community centre and a few bars. The town exudes a haunting stillness, even during the day, owing not just to its size and small population, but to its ingrained demeanour of hibernation set in stone during the long winters. After finding my bearings, I travel 20 kilometres east, along a lonely road running parallel with Hudson Bay, to a far-flung extension of the town. Situated at arm’s length from “donwtown” is the Churchill Northern Studies Centre – a scientific field research station that provides quiet sanctuary for students and academics specialising in Arctic and sub-Arctic research. “This is one of the only properly equipped places on Earth where people can come and do field work at this latitude,” says Richard Bello, a Toronto-based professor of Climatology who is measuring methane and carbon dioxide emissions from the melting permafrost. “Subjects here range from climate change, to polar bears, to snow geese, to insects and plants. Anything and everything goes.” The centre, which also offers summer classes to the public, grew out of a defunct missile range – a Canadian-American Cold War atmospheric test centre that sits moribund today among a patch of weather-beaten trees. Churchill, with its natural and cultural endowments is far greater than the sum of its parts. It has a different face at different times of the year. And though one can’t experience all sides of Churchill without living there year-round, residents will gladly tell you all about the city in its various incarnations. 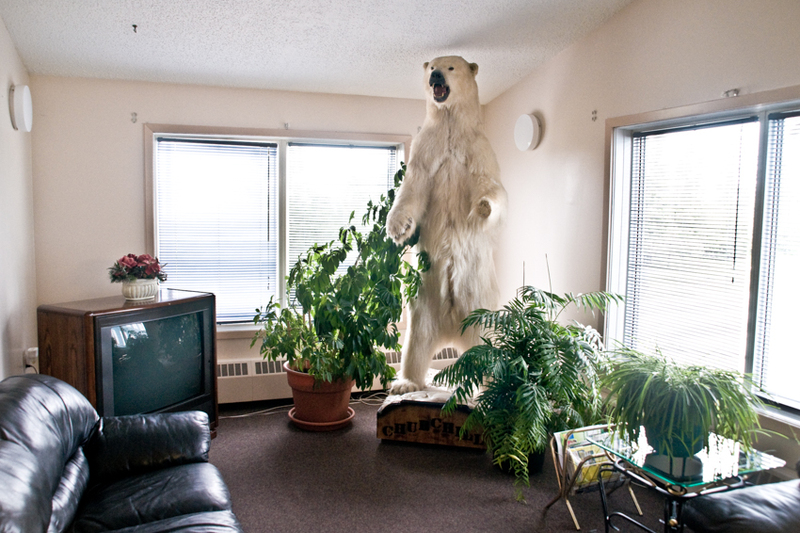 Churchill is built on the edge of one of the largest polar bear denning regions in the world. That area, in turn, is located near a place called Gordon’s Point – just east of Churchill. It is there that the winter ice on the western shore of Hudson Bay forms the earliest. In “bear season”, from September to November, upwards of several hundred polar bears emerge from their denning areas and congregate along the bay’s shores waiting for the day when the ice can support their weight so they can embark on their annual winter seal hunt. For several weeks in autumn, gangs of tourists, photographers, journalists and nature enthusiasts descend on the town and pay top dollar to see the massive congregation of bears. Companies running fleets of giant ground vehicles with high outdoor viewing decks, called “Tundra Buggies” charge $400 per person to get up-close and personal with the bears. And a small constellation of otherwise sleepy motels with names such as Lazy Bear Lodge, Polar Bear B&B, the Tundra Inn and Northern Lights Lodge come alive for the ritualistic observation. Despite the variety of other draws and activities on offer in Churchill throughout the year, it is the polar bears that have come to define the town. 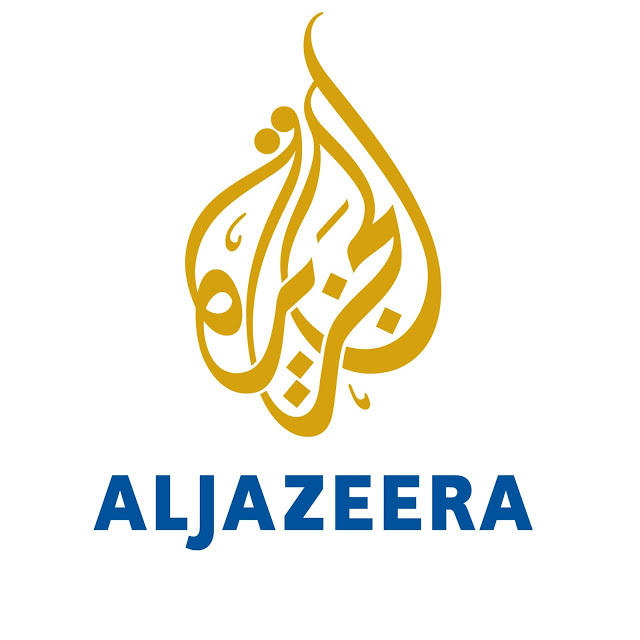 So much so that they’ve seeped into the collective psyche of its residents. Instead of making small talk about the weather, Churchillians chit-chat about bear sightings. Polar bear paraphernalia including stuffed bears, bear rugs, and bear statues and carvings punctuate the town at every juncture. But in Churchill, the relationship between the planet’s top predators can often be an uneasy one. Beyond the spike in bear activity in the autumn, a few of the animals linger on the edges of town year-round, constituting a borderline nuisance and, at times, even a threat. The coastline running along, and past Churchill is known as “Polar Bear Alley”. A series of signs along the waterfront warn the heedless that they’d do better to stay away. Conservation officers armed with guns and noise-maker projectiles called “bear-bangers” designed to scare off emboldened bears, are never too far away. And a so-called “polar bear jail”, located on the fringes of Churchill, houses troublesome sub-adults during the off-winter season. Just before my arrival, a traveller from Vancouver made the headlines after he wandered into Polar Bear Alley one morning and was chased – and nearly mauled – by an itinerant bear. Weeks later, the town was still abuzz from the rare close call. There was no lack of discussion among locals about the encounter, which they unanimously condemned as foolish and preventable. A quintessential outdoorsman, Ratson has a rifle and pair of binoculars permanently attached to his person. He also lives in semi-seclusion with his family and dogs. He takes me on a short walkabout of the area to show me the variety and richness of tundra life. Swarms of “bulldogs” – the local name for the large and aggressive species of biting horse flies (that can grow to the size of a person’s thumb) harangue us the moment we leave the vehicle. As we walk down to the rocky beach, ever careful to keep an eye out for bears, Ratson provides a crash-course on the countless plants, flowers and animal species that appear along our path: from Arctic daisies, to Reindeer lichen and a variety of ground-nesting birds. Farther down the coast is a large shipwreck. 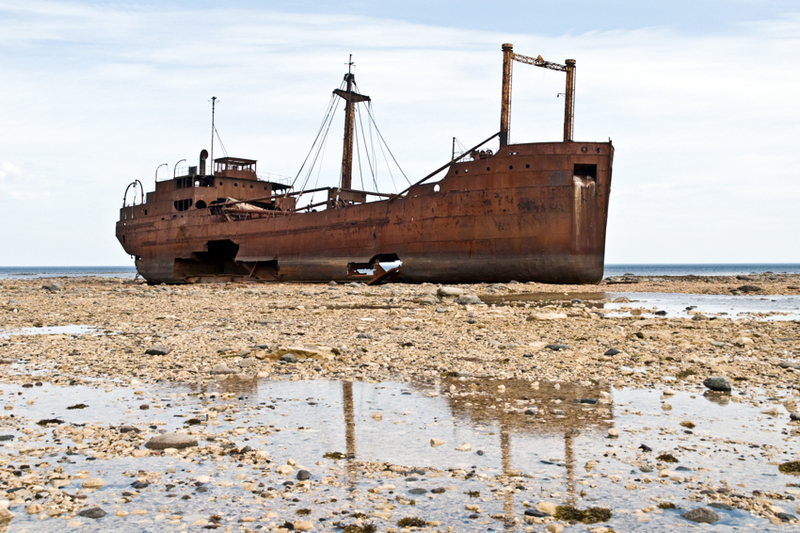 The Ithaca is a British-flagged steamship that ran aground during a storm in 1960 and whose ghostly, hollow shell has been rusting in the shallows ever since. We arrive at low tide and are able to make our way to the wreck along rocks rising from the shallow pools of seawater left by the receding bay. As we rest in the shadow of the giant freighter, I ask Ratson if, as a nature enthusiast, he had ever been tempted to leave the tundra and start anew in another part of the Canadian wilderness. Perhaps in view of a polar bear hidden somewhere behind us in the rocks, we pick up our things and start back in the direction of Churchill – that tiny community described by its denizens as “the biggest little town at the edge of the world”. A version of this article ran in travel section of The National on August 27, 2011.